Right now, there are so many music services vying for my ears. I am completely tied to and happy with the Apple ecosystem (iPhone 6 Plus, iPad 2, Apple Watch, Apple TV 4th Generation). I have tried both the free and paid version of just about all of the big streaming music services (Apple Music, Pandora, Deezer, Tidal, etc). I have fallen in love with Spotify all over again because of one feature, Discover Weekly. As a teen, when I first started discovering glam rock in the late 80s and grunge in the early 90s, I used to love making mixtapes for my brother (@AmishBabu) and myself. Spotify Discover Weekly is my mixtape engine/generator circa 2016. Discover Weekly is updated every Monday morning with 30 songs (about two hours) of personalized music recommendations delivered in a personal playlist. Every song in Discover Weekly is based both on my own listening as well as what others are playlisting and listening to around the songs I love – making the playlist completely unique and customized to me. Spotify is learning what I like and making my very own personal mixtape every single week. Moreover, as the system learns my tastes/preferences, Discover Weekly continually improves at recommending music it knows that I will like. Then, next Monday, that playlist disappears and I get another 30 songs. Spotify Discover Weekly works so well because it does not require any effort. All I have to do is listen to music and Spotify’s algorithms handle the rest. Moreover, it does a great job of balancing familiar music with new tracks and artists that I have never heard before. No other service makes music discovery as personal and does it this well. It’s genius and perfectly fits what I want. I actually created a “Best of Discover Weekly” playlist so I could save all the best tracks from each week. Every week, I keep adding more track to that playlist. My “Best of” playlist is getting larger and getting so good that it is the only way I listen to music (aside from going through my Spotify Discover Weekly every morning during my walk to work to figure out what new tracks to add). An added surprise benefit is that this also means that I don’t have to pay for music anymore; my “Best of” playlist is so good that I am more than happy just turning it on and letting it shuffle. Spotify Discover Weekly helps me curate a very highly personal music library without any effort and yet helps me discover new music. And it does all that for free. What more could I ask for? You know what I will be doing every morning from now on during my walk to work. Click here to listen to my “Best of” playlist on Spotify. I just signed up to Gillette’s new Shave Club and I love it. Check out the video above for the unboxing and the post below for my thoughts. I resigned myself, a long time ago, to the fate that I won’t be able to grow out a dope lumberjack beard. My beard becomes too itchy after 1 week of not shaving. So, like my most men, I am fated to a life spent groggily taking a sharp metal blade to my face every few mornings to scape the hair off my face. And like most men, every few weeks, when I reach for a new, fresh blade, I find that I have run out. I prefer blades the give me a close and comfortable shave without nicks and cuts. I am okay spending a bit more to get a great shave, and the Gillette Fusion ProShield is the best. The new ProSield strips let me slide around my face and get a close and comfortabel shave without ever having to worry about nicks and cuts. I have tried the Merkur Safety Razor in the past. It does get a slightly better shave but you have to be more careful than I typically am in the morning when I am trying to rush out of the house. WIth the Merkur, I end up getting more nicks and cuts. Before special events, I use a safety razor, but it’s not my everyday go-to. I also have tried the blades from Harry’s and Dollar Shave Club. They are good but not great. The shaves are not nearly as close, so I find myself not looking as clean shaven as when I use my Gillette blade or I have to shave more often. 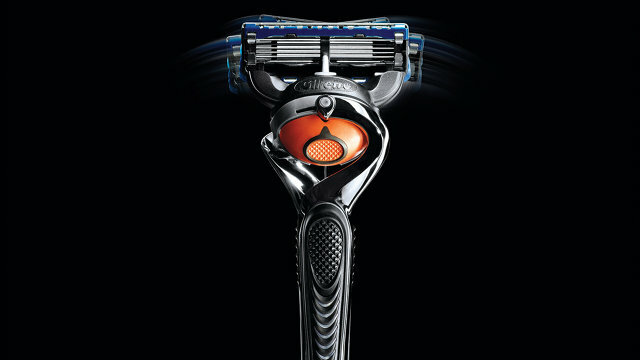 The Gillette Fusion ProShield comes with a FlexBall handle. I was skeptical about the FlexBall at first. But after a few uses, I realize that it saves me a bit of time. Because it bends to the contours of my face, I have to make fewer passes to finish my shave. Other handles from Gillette work fine, I just have to make a few extra passes to angle the razor around the contours of my face. The ProShield also helps me move faster because I don’t have to worry about nicks and cuts. Speed was the big drawback for me on the Merkur Safety Razor. The Merkur provides a better shave but if you don’t want to nick or cut yourself you have to go slower and take more time. That time adds up over a year (5 minutes/shave x 4 shaves a week x 52 weeks = slightly over 17 hours a year). I also find that I am slower with the blades from Harry’s and Dollar Shave Club. I have to take more passes with them and without a precision trimmer on the back of those blades it takes longer for me to shave under my nose and do trim my sideburns. Dollar Shave Club pioneered the delivery/shipment of razor blades and was quickly followed by Harry’s. I prefer to not have to go out to get my razor blades, so ordering online suited me. However, having a subscrioption service was a benefit to me because I used to always run out of blades and then have to wait a few days/shaves to order more blades online and have them delivered. I know how often I need a blade (with Gillette, I go through 1 Fusion blade a month with 3-4 shaves every week). You could set your clock/calendar to my shaving routine, so a subscription service made the most sense. I always have a new blade when I need it and don’t ever forget to order or run out of fresh blades. In terms of convenience, my big issue with Merkur Safety Razors is that I travel a fair amount and usually fly with only carry-on luggage. I could not bring Merkur blades with me when I traveled, so I would have to end up with a Gillette system or equivalent anyways for travel. I never wanted to have that much shaving stuff and invest into two different systems. Gillette also offered the lowest environmental impact of any of the shave systems. With a Merkur, I would go through more blades in a month than I would with a Gillette. Same goes for Harry’s and Dollar Shave Club. So I feel like I am using up less resources and creating less waste by using the Gillettte system. I also live in SF, so floor and storage space is always at a premium. With the other shaving systems I felt like I had more stuff than I did with Gillette. Not a big deal but if every square inch counts in your residence, than the Gillette may be a better choice. Overall, the Gillette Shave Club with the new Fusion ProShield blades were the best choice for me. Harry’s and Dollar Shave club are great subscription services but were not as good in terms of speed and quality of a shave and created more waste. Merkur is the best shave but you waste a great deal of metal as well sacrifice convenience while traveling and you have to take more time when shaving to be careful not to nick or cut yourself. I also love having a simple routine in terms of replacing my blades; with Gillette I know it gets a full month of shaves for me so on the 1st of every month I know to replace the blade. WIth the others, every few weeks I find myself standing in front of the mirro with shaving cream on my face trying to figure out whether I replace the blade 1 weekend ago or two weekends ago. Gillette just makes it simple and easy. It’s one or two fewer things for me to have to worry about. I am always in favor of products that maximize my requirements and simplify my life. @TeresaJLo & I are traveling to Oahu. Itinerary Link. Would welcome any suggestions. Right now, we have a fairly full itinerary at a pace that works for us. We are really looking forward to underwater/snorkeling activities and beach time. Also looking to hit up “local” restaurants where we can get food that we would not be able to get in San Francisco or New York. We have most of the mornings carved out for hikes. Any insider tips would be appreciated. Also looking forward to hanging out with our old friends Bobby and Jenn and their new son (hat tip to Bobby … thanks for your service in the Navy). Many of our friend from LA make a beeline to Palm Springs whenever they need a weekend away from the city. I always thought of Palm Springs as a sleepy, desert town where a lot of people go to retire. Boy was I wrong. We had a blast there. It’s a great weekend getaway from LA and, for those in SF like us, it’s a great weekend getaway if you can snag cheap airfare. We were able to plan in advance and track flight costs and snagged $118 roundtrip tickets between SF and LA. We just rented a car for the weekend and drove out to Palm Springs. Without traffic the drive is about 2.5 hours from LAX. I would highly recommend having a car while you are out there. The highlights of our trip were just laying around the pool at our hotel and hiking around the Palm Canyons. Or more accurately, we hiked and then lounged around the pool. Most of the pics are of Palm Canyons, which are a short drive from the heart of Palm Springs and very accessible and easy. There are a bunch of trails at Palm Canyons and a variety of trail lengths so you can go for a short, easy 1-hour stroll to spending the day on hard terrain. If you do go to Palm Canyons, the best pictures and most interesting parts of the trails are where there is water. It’s remarkable how a little water can transform a desert landscape into lush vegetation. On a scale of 1 to 10, I give Palm Spring a 6. Definitely a great weekend getaway spot for those in LA, San Diego, or San Francisco. Though I don’t know how many times I would want to visit and I don’t know if I would not get bored if I spent more than a 2-day or 3-day weekend there. Surprisingly very few of our LA friends/colleagues have ever been to Joshua Tree. It’s one of the nation’s newest national parks, so perhaps it is still somewhat undiscovered. We recommend going during a warm winter weekend because the desert heat probably will be brutal when it gets warmer. Keep in mind that it’s the desert so it’s very dry out there. Bring lotion for dry skin and lots of water. Even though it was a cool day (high 60s, low 70s), we were surprised at how much water we were drinking to keep from getting parched. One thing we did not fully appreciate before we went there was that the area is great for rock climbing and bouldering. We wished we were better prepared and allotted more time for rock climbing. If you are ever going out to Palm Springs for a weekend or holiday, I highly recommend to spend one full day at Joshua Tree. Get up early and spend the morning bouldering or rock climbing before it gets too warm. The main sites/attractions (including the odd-looking Joshua Trees themselves) are driveable and/or accessible on short hikes, so save them for the afternoon. I am making a resolution to read 1 book a week. Last week I held up my resolution and read The Audacity of Hope by Barack Obama. As I said before, I enjoy reading and have not been doing enough of it. There are way too many titles sitting in iBooks and Kindle on my iPad mini. My book for this week is Jim Collins’ book Good to Great. I enjoy reading and have not been doing enough of it. There are way too many titles sitting in iBooks and Kindle on my iPad mini. My book for this week is Barack Obama’s – The Audacity of Hope.